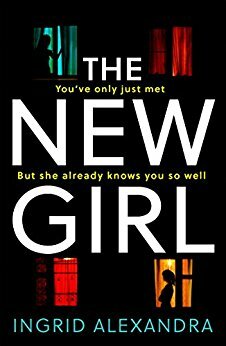 Sit back and enjoy an thriliing extract from Ingrid Alexandra’s chilling new book called ‘The New Girl’. The wine is cool and crisp as it passes my lips and, after a couple more sips, the familiar warmth curls in my stomach like a cat settling in for the night. Humming a catchy tune I heard on the radio, I flip through the mail. An estate agent advertisement, the electricity bill and a letter, the one with the brown stain on it, addressed to someone named Sophia Gates. It’s the second time this person’s mail has arrived here; Sophia Gates must have been the previous tenant. I toss the letter into the recycling, take a long pull of wine and then pause, rubbing a finger along my lips. I knew someone named Sophia once. Or Sophie, maybe. I think for a moment but my mind’s cloudy, and I can’t remember anyone specific. It’s probably no one important, yet I have that feeling I get at times, like I’m supposed to remember something but there’s a brick wall in my mind and my thoughts stop there. A blank space, as I’ve come to call it. My wine’s nearly gone and no one’s home yet, so I top up my glass with a bottle from the laundry. I go to my room, sit at my desk and flip open my laptop. I check my email, trawl through my newsfeed. Without planning to, I google the name Sophia Gates. Images, Facebook pages and LinkedIn accounts pop up, but I don’t recognise anyone. I’m being stupid, paranoid as usual. It must just be a coincidence. ‘Any mail?’ Cat’s voice calls from the kitchen, startling me. I hadn’t heard the door. ‘On the coffee table!’ I tell her, gulping a mouthful before hiding the glass under the desk. Just a short taster, that really leaves you wanting more. You can buy The New Girl from Amazon and will be available to buy from good bookshops from 4th October 2018.